Some 4.5 million people in the Sahel and West Africa were in need of assistance during the period from October to December 2018. About 182 000 people required emergency assistance in Nigeria, Mali, The Gambia, Mauritania, Niger and Chad. In northeastern Nigeria, the area around Lake Chad and the Liptako‑Gourma region, this situation is due to the deterioration of their livelihoods because of persistent civil insecurity. If appropriate measures are not taken, nearly 8.9 million people, including 4.5 million in Nigeria, could be affected by June-August 2019. Some 500 000 people could be in urgent need. The food situation is also of serious concern in Niger where the number of food insecure people is likely to double from 600 000 people (phases 3-5) to 1.2 million people in need of urgent assistance (5% of Niger’s population). The number of food insecure people in other Sahelian countries has been reduced compared to previous years, but many areas still need timely and targeted support to help vulnerable populations. 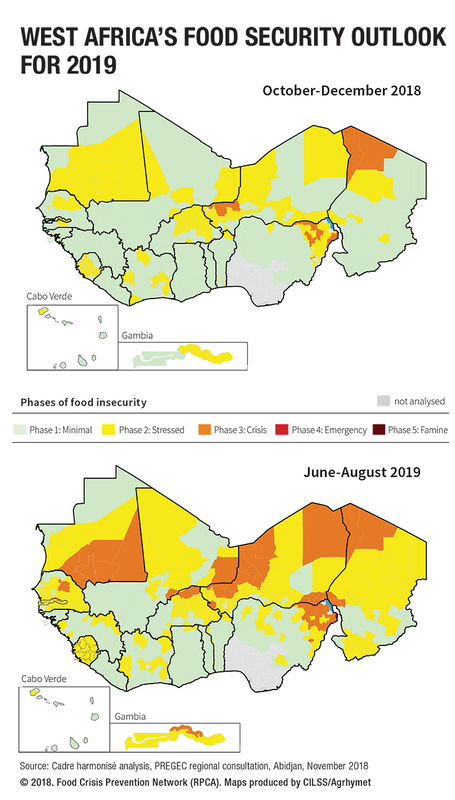 The Tibesti region in northern Chad and the department of Bilma in northeastern Niger have developed into a new food insecure area that will require close monitoring.